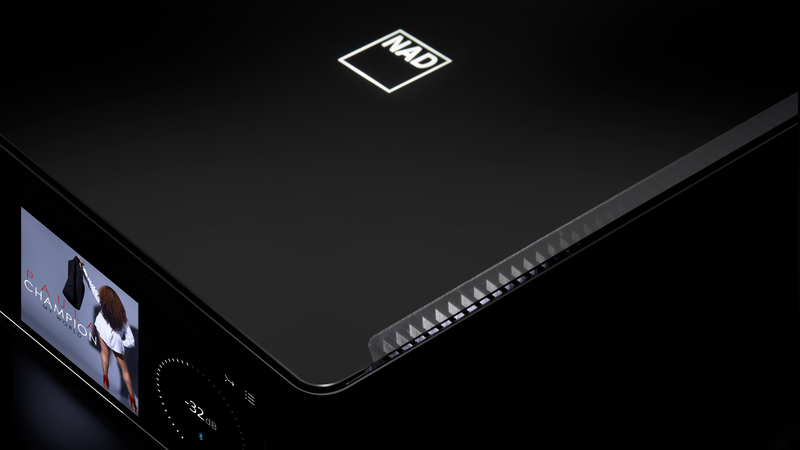 To celebrate the release of the M10, we sat down with NAD’s Chief Technology Officer to discuss the all-new BluOS streaming amplifier. The M10 is an elegant and compact statement of simplicity. Capable of driving even the most exotic high-end speakers with aplomb, the M10 is both easy to operate and beautiful to look at. Although the M10 is functionally similar to the Bluesound POWERNODE, it actually shares more technology with the Masters Series M32, M12, and M22. Starting with the beautiful extruded aluminum chassis and Gorilla Glass top and front panels, even the smallest details are executed with the highest quality parts. The luxurious fit and finish and simple forms that define this product belie the complexity inside. The intuitive front panel operation is mirrored by the free app available for Android, Apple iOS, desktop and several Smart Home control systems. Many functions can also be controlled using Alexa or Siri voice commands. This level of control is totally unique and unprecedented in the category. The TFT front panel display changes from ‘far,’ or FrontView, to ‘near’ when touched. The FrontView display shows artwork and song titles with BluOS, and alternatively features peak reading VU meters when other inputs are engaged or selected in user preferences. The near display allows volume and track selection on the top menu, and three other levels offer input selection and setup options. At the heart of the M10 is BluOS, the operating system for high res music. This completely custom operating system is based on a Linux kernel and is running on a powerful NXP 1 GHz ARM processor. BluOS is unique in its tight integration of hardware and software creating a true high-end listening experience whether your music is stored locally or streamed from the cloud. It is also part of an eco-system of BluOS products that can be used together on the same network to create a multi-room music experience, with products available from several brands that are guaranteed to work together perfectly. Even local sources can be streamed across the network to other BluOS players which can be synced to play in unison, or to play a different source. With some 20 music services integrated and supported by BluOS including AirPlay 2, Amazon, Spotify, Tidal, and Qobuz, the world’s music is available at your fingertips. In addition to 24/192 PCM, MQA is fully supported, as well as FLAC, WAV, and all flavors of compressed audio codecs like MP3 and AAC to mention a few. Bluetooth streaming is also supported, and the M10 uses the latest and highest resolution aptX HD. This 24-bit capable codec uses only 4X compression to create the best sounding Bluetooth you’ve ever experienced. Additionally, this Bluetooth radio can be set to transmit audio from the M10 to wireless headphones or even Bluetooth speakers. The M10 also supports both analog and digital wired source components, like disc players. There is also an HDMI input that supports eARC allowing the M10 to integrate directly with many TVs to provide both sound and control. Intuitive menus allow the user to configure each input to customize the M10 for their specific needs, including the naming of inputs and disabling of unused inputs. An improvement over earlier BluOS devices, the M10 makes all local sources available across the network. Dirac Live is a very sophisticated room correction system that measures the room using the supplied microphone and sends the data to the cloud where Dirac configures custom filters and then automatically loads them into the M10. The listening result is nothing short of extraordinary. Dirac manages the energy in the room so that transients have amazing impact and destructive resonances are diminished. Imaging and clarity are intensified in a very natural way. This is a one-time setting and corrects the impulse (time response) of the system as well as smoothing frequency response in the bass region, up to 500Hz. For more difficult rooms or systems using multiple subwoofers there will be optional enhancements that can be purchased by the customer directly from Dirac. We feel that this model is the most cost effective for all, offering a great basic package with enhancements available for advanced users. We have chosen the ESS Sabre DAC for its high precision, low noise, and unique jitter reduction circuit. The 32-bit HyperStream™ DAC architecture and Time Domain Jitter Eliminator offer state-of-the-art performance for High Res audio streams. The ESS 9028’s programmable output filter makes it an ideal candidate for MQA fine tuning. The Hypex nCore amplifier design has been used in other NAD Masters Series models to great acclaim. This design is very unique in a number of aspects. It is Class D architecture, but doesn’t use a clock or sawtooth generator for modulation; rather it is a self-oscillating design using multiple nested feedback loops. This patented solution has many positive attributes. It is all discrete and has nearly immeasurable noise and distortion. It does not have the crossover notch distortion that plagues most Class AB amps. Notch distortion creates many odd order (non-musically related) harmonics that can sound very harsh. A common problem with Class D amps is that the output filter can interact with the speaker load altering frequency response, but the nCore is a ‘load invariant’ design that includes the output filter in the feedback loop, correcting the response to flat. With 100W continuous ‘Full Disclosure’ power the M10 can power almost any speaker to lifelike listening levels. Importantly, there is a great deal of Dynamic Power on tap; 160W@ 8 Ohms and over 300W @ 4 Ohms to accurately reproduce musical transients. This bestows the M10 with a lively yet relaxed sound that immediately draws the listener into the performance.